FANBOY PLANET.com . : mc-batkid-begins-julia-roberts :. This past summer, we got wind of a documentary on one of 2014's finest moments: the city of San Francisco stopping everything so that one boy could have his wish. 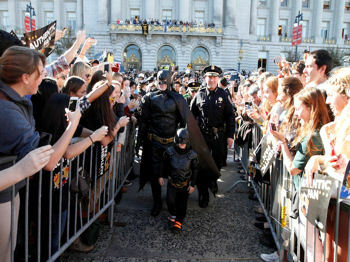 Miles Scott, a four-year-old boy fighting leukemia, wanted to be Batman. And the city obliged. We interviewed director Dana Nachman on the podcast just before Comic-Con, knowing this was something special and important. Now six months later, we're gratified that everybody else thinks so, too. First, we thought it extremely cool that legendary poster artist Drew Struzan came out of retirement to render their movie poster. Serious geek cred right there. But it gets better. 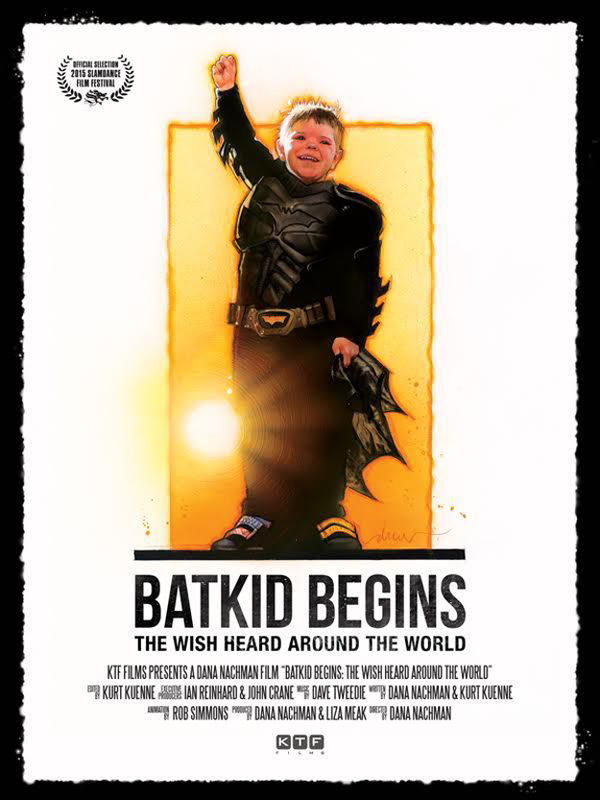 Today (January 24), Batkid Begins: The Wish Heard Around The World makes its world premiere at the Slamdance Film Festival, and that's not going to be the end of it. Yesterday, boutique documentary distributor SUBMARINE announced that Julia Roberts has attached to the remake rights of Batkid Begins, through their new label SUB/VERSION, dedicated to remaking documentaries as "narrative adaptations." According to their press release, "Roberts, who will produce with partners Lisa Gillan and Marisa Yeres Gill through their Red Om Films banner, is attached to star in the feature remake of the real life story about how a Make-A-Wish event for Miles ...wanting to be Batman for a day turned into not only a citywide spectacle with over 25,000 San Francisco residents coming out to participate, but a worldwide phenomenon on social media with nearly 2 billion participants thanks to Mashable, Twitter, Facebook, Instagram and others." Think about that. Nearly two billion people shared this moment. A quarter of the planet took a moment to consider that maybe, just maybe, we could be better. Documentary director Nachman will serve as executive producer, alongside Josh and Dan Braun of Submarine. "It's thrilling to me that Ms. Roberts and her team watched our film and were so moved by it that they want to dedicate their time and creative capital to make sure the wiedest audience possible will know and love Miles' story and the spirit of this intimate special event that went global, as much as we do," Nachman said in the press release. It's thrilling to us, too, and we look forward to the chance to see Nachman's film. Just for further geek connection, Submarine controls the rights to Creepy and Eerie, so also work with our friends at Dark Horse Comics. Miles, it's your world. Thanks for helping make it a better place.